Just so the food processor can process your dough easier, cut up the butter into cubes before putting them in the freezer to chill. In a food processor, dump in the dry ingredients for your crust. That would be the flour, brown sugar, confectioner's sugar, salt, and cinnamon. Pulse it to get rid of any large lumps. Then, add your chilled butter and let it run until the mixture resembles fine to coarse sand. Drizzle in your ice cold water a tablespoon at a time until a nice dough comes together. You're looking for a dough that isn't too wet, but comes together when you squeeze it in your hands. Bring the dough together, trying to knead as little as possible and wrap it in plastic to rest in the fridge. For the allspice I'll just grind up a few seeds in a spice grinder. The nutmeg is easier, just grate it on a microplane. Add the allspice, nutmeg, ground ginger, salt, and cinnamon to a saucepan. Along with the spices add 1 3/4 cup of milk, a 1/3 cup of brown sugar, and the vanilla. Whisk and put it on medium to come up to a simmer. Once it comes up to a simmer, cut the heat and set it aside. Separate six egg yolks, add to it the cornstarch, a 1/2 cup of milk, and the remaining 1/3 cup of sugar. Now in one hand pour the hot milk mixture into the egg yolks, and with the other whisk constantly so the eggs don't curdle. Pour the entire mixture back into the saucepan and whisk constantly over medium heat until it thickens, about a minute. Keep whisking it to get rid of any lumps. Cover it with plastic wrap remembering to touch the plastic to the cream so it doesn't form a skin. Refrigerate until needed. It'll get thicker as it cools. Butter a 10 inch tart pan preferably with a removable bottom. Press the dough into the pan and work it so it covers the bottom evenly and runs up the sides. Dock the bottom of the crust and cover it with a buttered sheet of foil. Fill the pan with baking beans or uncooked rice. Blind bake for ten minutes, pour the beans out (you can still reuse them) and remove the foil. Bake it again for another 5-10 minutes until the bottom is golden brown. Let the shortbread cool for 15 minutes on the counter. Fill a pastry bag with the pastry cream. Pipe your cream circularly starting from the center out. Refrigerate it so it sets. Core and thinly slice some apples (whichever variety you want). Toss the sliced apples in a bowl of lemon juice and water so they don't oxidize. 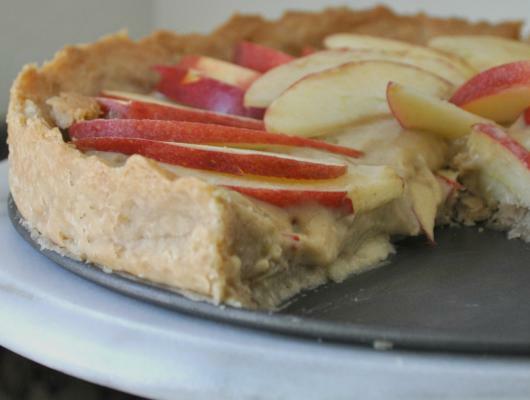 Finally, line the tart with the apple slices. Keep going around until you've completely lined the perimeter. Then the next spiral go around the other way. Lastly garnish with the prettiest apple slices sticking up from the center. When you're ready to serve brush the top with calvados or apple marmalade to make the top shine. All that's left to do is enjoy! And as always, Chow! 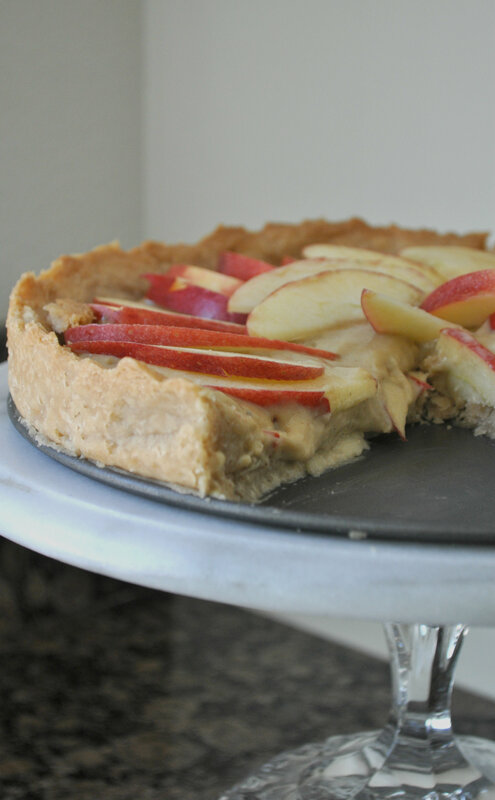 This decked out apple tart consists of a cinnamon shortbread tart shell, filled with a pastry cream spiked with autumn spices and topped with sliced apples. Every bite literally brings back poignant memories of Thanksgiving past.